Singing together to nourish the soul and re-enchant the world. New Songs Being Added to the site regularly. Check back. See below for What’s New. Singing together to nourish the soul and re-enchant the world with song. Part of my mission is to re-acquaint people with their birthright and natural ability to make beautiful and meaningful sound together. Most of the songs I’ve written are short, easy to learn, chant-like songs with several layers that fit over and around each other in interesting and pleasurable rhythmic and harmonic challenges that make them fun to sing. Group singing is one of the most ancient and primal “technologies of belonging” that we humans have been using since our earliest times, possibly before speech itself. 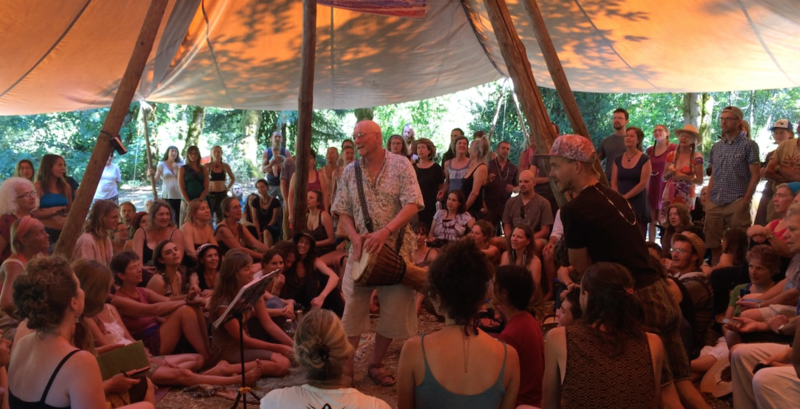 When we make joyous and passionate song together, it nourishes our souls and offers an enlivening gift back to the natural world that made us and gives us our sustenance and our very being. When such an exchange is genuinely made, and the song finds its natural ending, often there is a sweet, lively silence in which we simply stand and hold the “enchantment,” the sense of deep and genuine communion amongst each other and with the whole living world. You may have visited this site before, and have noticed that things have changed. A primary reason for rebuilding this site is that it is now accessible from mobile devices, so should you wish to learn and teach songs away from your stationary computers, the music will be right at hand, so to speak. As you may know, about two years ago we started a crowd-funding campaign through Indiegogo, to enable us to make these changes, with recordings of all the parts to each song, for you to be able to learn and teach the songs more easily. We have since recorded over ninety songs. Some of them are up now (beyond the original 18 from my CD “This Fire”), and we are in the process of recording the high parts for and mixing the remaining songs, and recording new ones as they come along. All of my songs will eventually be posted here with all the parts separated for easier learning, as well as the whole mix of all parts together, to give a feel for how the songs actually work. You will be able to play each part over and over until it’s learned, as well as hear how the song sounds with all the parts running at once. Of course, the true power and beauty of a song is best heard and felt most alive with a whole group singing together. This site is for helping you bring that experience to others. Along with the audio parts, you will also find the inspiration and story behind the song, and be able to download the written musical score. We are behind on getting scores and stories posted. Please be patient. If you need a score now, please email me. Any questions you may have about the songs, either the story and inspiration behind them, or further suggestions on how to teach them, can be addressed by corresponding with me on this site as well. I also love to hear back from you about how the songs are working, where they have traveled, and how they are being received. It’s the traveling of these songs that gives me the greatest joy. A multi-track recording with only a few voices is not nearly the same magic as many diverse voices singing together. It’s that large and lustrous group expression that gives us a sense of what the word “Universe” really means, “Unity midst diversity.” My fondest dream is that you take these songs and share and teach them with your groups and communities, workshops, festivals, rituals, families, etc. To this end, everything on this site is available for free. If you should like to support this work financially, you can go to the “Artist Donation” tab on the site. Although we have already reached our original goal for the campaign, the Indiegogo campaign will continue for a while, as we set our original goal at a minimum. Having reached that goal, we are allowed to continue the campaign to raise sufficient funds for further production costs, hopefully enough to make some mastered CD’s and hard copy song books of all the songs as well. When we get to that sufficiency, we will close the Indiegogo campaign, and any donations will still be gratefully received to continue the ongoing process of creating and teaching new songs. Thank you all so much from my deepest heart for all your support. One day while driving in to park at the EcoVillage, I opened my mouth and out popped this melody, with a bunch of unintelligible syllables posing as real words, something like, “Dah Wanyah, Ah-dah ma-yi-ki lah-wye!” I’d recently attended a songwriting workshop up in Victoria with Nashville songwriter Beth Nielson Chapman, where she’d suggested, when nonsense syllables come bursting in on a melody, to just “ride the vowels” and see what words they’re suggesting to you. So “Dah Wanyah” became “To Wonder” and the song commenced to write itself. If you have a choir, it’s fun to rehearse all the parts and then hold up a poster board with the words on it and ask the audience to sing along when you perform it. They always seem to jump right in on the melody and get a kick out of it, particularly the “Sometimes I have to confess..” part, where you can really ham up the “..singing with yooooo!” Remember, after the “singing with you” you plug in “in wonder” for “to wonder” and finish the song with “in”. Early on a summer day, walking down a trail in the Olympic Mountains with my sweetie. A clear summer day, fresh dew in the lupine leaves, butterflies and hummingbirds flitting among the wild flowers, sun-warmed tree bark casting that sweet alpine aroma, and a song in my heart and on my lips to sing with my love. This song has two possible versions shown, one in three parts, (shown in the first repetition on the first page), and one in four parts (shown in the second repetition on this page). The first version has the tenors and altos singing the same part, and would be easiest to teach to a group where you had limited time, and you just wanted to get folks singing joyously together while wandering about in a mingling cluster about a meadow on a bright morning to welcome in the day. The second version would be suitable for a group that has some rehearsal time available and would like to sing it with fuller harmonies. It’s also a song that lends itself to lots of playful improvised harmonies, whistles, bird noises, body percussion, whatever. I use this song as a way of expressing the “holographic” nature of things; seeing “a world in a grain of sand,” as William Blake put it. It is also a way to acknowledge that we each carry the whole range of human possibilities, from the sublime and saintly to the dark and dastardly. My teacher, Angeles Arrien, says “where’s there’s charge, there’s projection.” So this song is also a reminder to take home our projections, and hold ourselves and each other with compassion and forgiveness, because everybody ‘carries it all” or as the pastor of my youth, Dr. Dale Turner, was known to say, “Be kind. Everybody’s carrying a heavy load.” Teaching Suggestions: First, I teach everyone the bottom part, or “engine”. Then I introduce the three upper parts one at a time. If you have a choir already divided into SATB sections, you can teach the parts as written to the appropriate sections. In a less formally organized setting, I just teach the different harmonies, and ask people to choose the one that appeals to them. This is also a good song for people to just mill about amongst each other, singing their parts, gazing in each other’s eyes, and enjoying the cascading harmonies. It seems particularly useful after a workshop of deep sharing together.